What could be more important to a Deaf person than clear and healthy vision? Yet very few deaf people have entered the fields of optometry—eye care. Dr. Baker graduated from the New England College and Optometry in 1983, and is celebrating his 25th year as a staff optometrist of the Department of Ophthalmology at Massachusetts Eye and Ear Infirmary in Boston, a teaching affiliate of Harvard Medical School. He specializes in providing vision-care services to the Deaf and hard-of-hearing community. He enjoys his work and the satisfaction of providing vital services to the Deaf community in a Deaf-friendly way. There are a number of genetically-linked syndromes (an inherited group of symptoms that present a certain medical condition) involving deafness and various kind of vision problems. Since 45 percent of congenitally deaf people have an eye problem, compared to 10 percent of those born with normal hearing, early diagnosis and identification of the syndromes can help with genetic and career planning. Usher’s Syndrome is the most familiar of these syndromes. All of us know people with US. They’re born deaf, then experience gradual deterioration of vision due to abnormal buildup of pigment in the retina (retinitis pigmentosa). The onset of US can be anytime during childhood to the teens to adulthood. Loss of vision can be fairly rapid or quite gradual. People with US can lead full, active, lives, raise families, and have rewarding careers. As for the progress made in treating RP: “The best treatment plan of choice is dietary. It was recently discovered that eating two servings of oily fish per week, along with dark-green leafy vegetables, and taking 14,000 units of Vitamin A palmitate, could slow down the rate of degeneration from 9% per year to 3% per year, allowing the patient to retain useful vision to age 79, rather than 59. Eating right is very important! “Vision-rehabilitation programs and social services are excellent resources. With vision rehab, patients can learn about a variety of vision-aid devices, and social services can provide counseling and [further] resourcing. “Ultimately, it’s up to the patient to be their own best advocate. Most people are unaware of the limitations imposed by their condition, but it’s up to the patient to educate them. “Which brings me to the next point: all deaf people have an inherent responsibility to advocate on their own for not only their best interests, but for the best interests of everyone. If someone is talking to me without facing me, it’s up to me to advise them to please look directly at me while speaking, and not bobble their heads! Dr. Baker would like to see more Deaf students entering the vision-care and other health-related fields, but reminds them that being a physician can be very challenging and requires strong verbal skills. Here’s looking at you, kid! Photo credits: mini-tile and Flashbox: Massachusetts Eye and Ear Infirmary. 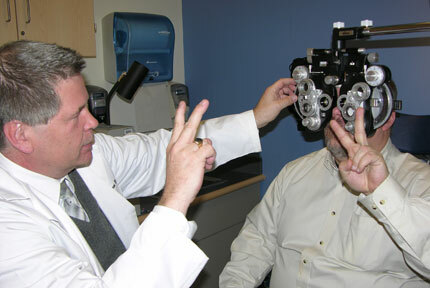 Above: Dr. Baker using a phoropter with John Monahan, ASL Specialist and Driver Education Teacher at The Learning Center for Deaf Children in Framingham.